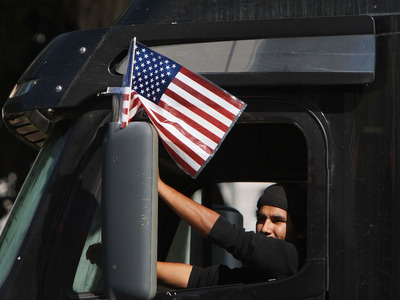 David McNew/Getty Images)Some truck drivers get paid less than minimum wage. A class action lawsuit in Arkansas of nearly 3,000 truck drivers argues that the practice goes against the Fair Labour Standards Act. Those drivers scored a major win today when the federal court in Arkansas ruled against motions by those drivers’ former employer: PAM Transport, an Arkansas trucking company founded in 1980. A federal court decision in Arkansas today may drastically change the way truck drivers are paid. The court ruled against PAM Transport, an Arkansas trucking company founded in 1980, after the firm was named in a class action suit for alleged violations of the Fair Labour Standards Act, a federal law that requires employers to pay truck drivers at least minimum wage. On Oct. 19, the US District Court in the Western District of Arkansas, Fayetteville division, denied PAM’s motions to dismiss the claims of the three truck drivers who sued PAM in 2016 and nearly 3,000 drivers who joined the class action suit. It’s a move that speaks to other court cases appearing around the country in favour of ensuring truck drivers are paid for every hour they spend on the road. Last year, a Nebraska court decided that trucking giant Werner Enterprises must pay $US780,000 to 52,000 student truck drivers for alleged pay practice violations. Another major carrier, C.R. England, paid $US2.35 million in back wages to more than 6,000 drivers in 2016. Unlike most workers who are paid per hour or in a yearly salary, long-haul truck drivers are typically only paid per mile of driving. However, they spend weeks on the road for work and hours every day doing non-driving work tasks. Truck drivers may be on duty a maximum of 14 hours in a day, with a maximum of 11 hours spent driving. They are expected to wait up to two hours when unloading or loading shipments; they are not paid for those hours waiting. Often, they spend even more time waiting for their shipments to load or unload and, even then, they are rarely paid “detention pay” for the time spent waiting. Justin Swidler, the attorney representing the truck drivers in the PAM case, told Business Insider that truck drivers might also spend hours or days not driving because they are waiting for shipments. They are not paid for that time. The Arkansas decision says that’s no longer acceptable. This case suggests that drivers are entitled to minimum wage for 16 hours per workday – every hour spent in the truck save for eight hours of sleep time. What does this mean for truck drivers and their employers? “The decision may have national implications,” Swidler told Business Insider. This case doesn’t necessarily mean the mile-based trucker pay model will be overhauled. But, it does suggest that, if a trucker isn’t paid at least minimum wage for the 60 hours a week they work, carriers will be held accountable. The payout for this case hasn’t been determined yet, Swidler said. In 2015, PAM paid truckers $US3.45 million in a similar settlement concerning a class action suit by employees who alleged PAM didn’t pay them minimum wage.